There are several versions of Orange Pi computers. I will describe here Orange Pi Lite and Orange Pi One (which seems to be no longer manufactured, since 2017-01). The http://orangepi.com/orange-pi-lite is a palm sized (69 x 48 mm) computer that plugs into your TV and can use an USB keyboard and an USB mouse. It’s a capable little PC which can be used for many of the things that your desktop PC does, like spreadsheets, word-processing and games. It also plays high-definition video. The community page has some more details. Linux software: Armbian is described well. I will explain here some specific Know How concerning practical use. Please see the picture below for details (click on picture to expand). The picture below shows the Orange Pi Lite (WiFi and Bluetooth version) with the serial port connected to a USB to serial converter, in order to setup the WiFi interface. The serial data wires RX and TX (or RD and TD) are connected 1:1. Please take care to use the 3.3 V version of the serial converter. A 5 V version can damage your Orange Pi. If you are using a DVI adapter on your monitor, you will probably see no picture. The fix is explained later. Orange Pi Lite is the Orange Pi version with WiFi and Bluetooth, without Ethernet port. A schematic is available. # cd to download folder of "Armbian"
Because it is so cheap (about 27 EUR ), it is very attractive to use it in all kinds of embedded computer projects. The offer is from https://www.aliexpress.com, search for Orange Pi Lite SET12, it contains an Orange Pi Lite + Transparent ABS case + power cable + 16 GB class 10 micro SD card. The Armbian (Debian) software can be downloaded in a XFCE4 Desktop or Server version. Please read the Quick Start page for informations. I am using the Desktop version. When the software on the micro SD-card is OK, the green LED blinks, or lits steady. Because the Orange Pi Lite does not have an Ethernet port, the WiFi connection must be configured via the serial port (115200 Baud 8N1). To make the connection to a computer with a terminal (PUTTY or CoolTerm), you need an USB to serial converter (3.3 V version only), as shown in the picture above. In my case I did not need to cross RxD and TxD wires. You can use in PuTTY the mouse scroll wheel switch to insert text from the clipboard. ion_reserve_common: ion reserve: [0x56000000, 0x60000000]! Next you will be asked for the root password ("1234"), and need to change it to a new one. Then you will be asked for a user name with some not so important details, and a user password. Preferably the user name is pi. Then it is much easier to copy and paste the terminal commands from my web page. # you see, there is not yet an IP number available! # install the powerful file manager "midnight commander"
# allow F10 key: Tab Edit->Preferences - remove mark from "Enable the menu accelerator key"
The following chapters concerning configuration and setup are common for the Orange Pi One/Lite. While inserting the Orange Pi board into the housing, I unfortunately broke the micro SD-card, because of the land between micro SD-card outcut and camera cable outcut. In order to avoid that in the future, I cut out the land, as you can see in the picture on the right. The lower housing still has the lend, while it was cut out in the upper housing. It looks like, that this board no longer manufactured, since 2017-01. Orange Pi One is the version with Ethernet port, without WiFi and Bluetooth. A schematic is available. Because it is so cheap (about 25 EUR ), it is very attractive to use it in all kinds of embedded computer projects. The offer is from https://www.aliexpress.com, search for Orange Pi One SET7, it contains an Orange Pi One + Transparent ABS case + power cable + 8 GB class 10 micro SD card. The following software additions will make it more comfortable to work with the Orange Pi. 480i        use "-m 480i" or "-m 0"
576i        use "-m 576i" or "-m 1"
480p        use "-m 480p" or "-m 2"
576p        use "-m 576p" or "-m 3"
720p50      use "-m 720p50" or "-m 4"
720p60      use "-m 720p60" or "-m 5"
1080i50     use "-m 1080i50" or "-m 6"
1080i60     use "-m 1080i60" or "-m 7"
1080p24     use "-m 1080p24" or "-m 8"
1080p50     use "-m 1080p50" or "-m 9"
1080p60     use "-m 1080p60" or "-m 10"
1080p25     use "-m 1080p25" or "-m 11"
1080p30     use "-m 1080p30" or "-m 12"
1080p25     use "-m 1080p25" or "-m 26"
1080p30     use "-m 1080p30" or "-m 27"
4kp30       use "-m 4kp30" or "-m 28"
4kp25       use "-m 4kp25" or "-m 29"
800x480     use "-m 800x480" or "-m 31"
Virtual Network Computing (VNC) allows you, to show the monitor screen of a remote computer (VNC Server) on a local computer (VNC Client), also to use your local keyboard and mouse for control of the remote computer. That allows to control a remote computer which does not have its own screen, keyboard and mouse. # if there was time to the last update, do it now. For an automatic start of the VNC server, you need a script, see at the links. # Check the user name in line 16 and adopt if necessary. At the moment it is set to "pi". # For safety reasons the user should NOT be named "root". # Put the script in the "run levels"
# Install program to synchronise the clipboard for VNC use. Now you can establish a connection with a VNC client viewer. In Finder you select: Goto/connect to server, Server address (e.g. ): vnc://192.168.17.171:5901 . Unfortunately the build in VNC client does not support alt gr characters. The window size default is 1024 x 768 Pixel. In the VNC viewer, if you start a program with sudo, you can get an error _tkinter.TclError: couldn't connect to display ":1.0". # Please be care that for entering the password an ENGLISH keyboard is used! # for password "raspberry" you must type "raspberrz"! Now it should be possible to start a X-Windows program with sudo. # and read "man scrot"
Unfortunately the function command complete in the terminal with the TAB key does not work in XFCE, see here. <Super>Tab -> edit value: delete text "switch_window_key"
#   Click on folder icon in upper left edge of the window. #           Tab Display->List View-> check mark "Navigate folders in a tree"
# test if user was added to group "sambashare"
in window " Folder sharing" mark "share this folder"
option: mark "Allow others to create and delete files in this folder"
echo "<txt>"$(cat /etc/armbianmonitor/datasources/soctemp | sed 's/\ \ */ /g' | cut -f2 -d" ")"°C</txt>"
Command: /home/pi/Install/cpu-temp_panel.sh   # adopt the user name, if not "pi"
Now you should see the previous mentioned computer informations, like to see on the screen shot above. Python2 is already installed, but some support is missing. Python3 is already installed, but some support is missing. The screenshot on the right shows the started test program tkinter-test.py, which works as well with Python 2 as Python 3. The used Terminal is the GNOME-Terminal. The Graphical User Interface (GUI) desktop is xfce4. The xfce4 desktop is shown in the RealVNC viewer on Mac OS. I have a home made Wobbulator, RF Network Analyzer working with a Raspberry Pi. I liked to know, if it also works with the Orange PI Lite, with a WiFi network connection to a laptop computer. That offers the possibility to run the application portable with a 5 V powerbank. The average power consumption in this case is about 0.4 A.
Fortunately the 26 pin flatcable connector was hardware compatible, just the software needed some modification. A patch file can be downloaded, to show the difference in hardware access from Raspberry Pi to the Orange Pi. The screenshot above shows the Orange Pi Lite desktop with the program wobbulator2.6.3o.py running. The test object was a 10.7 MHz filter, scanned from 1 MHz to 31 MHz with an increment of 100 KHz (300 steps). The input RF-level to the filter was about 0 dBm. The sweep time was 1.1 seconds. You can see, that the filter has a side peak at about half the major frequency (5.35 MHz), which is about 23 dB below the filter working frequency amplitude (-9 dBm). Because of different net storage capacity values, it is advisable to use 95% only of a SD-card. That avoids problems when cloning an image to a slightly smaller SD-card. I tested with good success the above mentioned wireless mouse and keyboard, see on the first picture on this page the wireless dongle. The benefit is, that you have now 1 free USB port. Here are documented hardware I/O related informations. There is no Analog to Digital converter, but you have a Pulse Wide Modulation (PWM) output. There is a microphone for Audio input. Audio output can be achieved via HDMI device (TV, Monitor). Wiring Orange Pi is a GPIO library, explained here, and can be clone with git, or downloaded and unzipped in user folder. 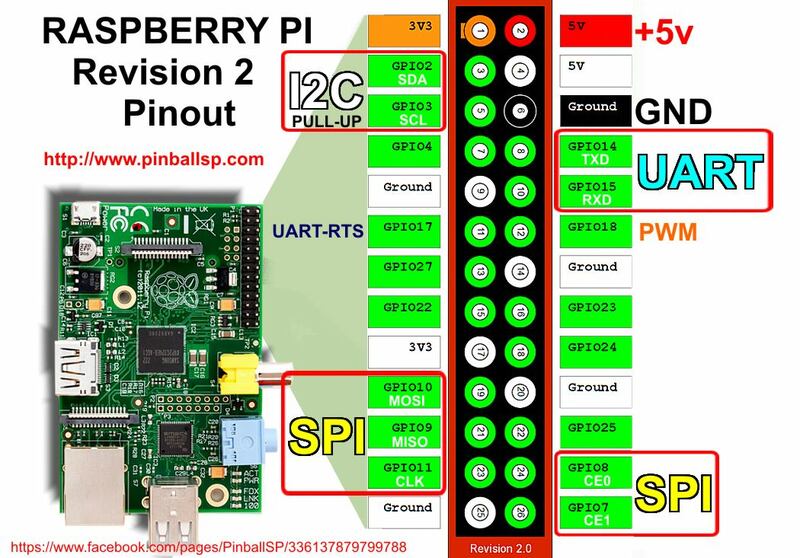 More Python GPIO examples are here. # Status LED and LED on pin 11 should blink 3 times. Also called TWI (Two Wire Interface, maybe clock stretching is not supported). I2C-bus was designed by Philips in the early ’80s to allow easy communication between components which reside on the same circuit board. Philips Semiconductors migrated to NXP in 2006. # Now i2c access needs no longer "root" rights, just group "i2c" rights. # If "i2cdetect" is not found, add "sbin" to the environment "path". There is a nice test program for I2C LCD (16 x 2 characters, Adapter PCF8574). It needs a little modification, then it works. The infrared Port is just a receiver only, see Links #2.